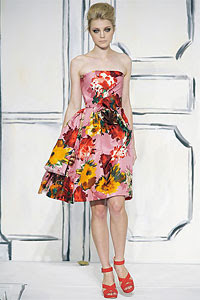 Oscar de la Renta is synonymous with tailored elegance and, true to form, the Spring collection was chic, though not surprising. Then again, if it's not broke, why fix it? To see the whole collection, Style.com. I think I could love all of them! DEFINITELY my favorite collection of the season. The belted skirt and jacket combos? Brilliant. Classy. Gorgeous. GOD I WANT THEM ALL! Omg for the black one on the bottom with the Tiffanys style top. DIVINE. Im totally drooling. not very spectaculair, but i absolutely love it! so classy. i love it!